How should we interact with machine learning? Is there a way to better understand what machine learning systems do and how? What role can visualization play in machine learning? These are some of the questions we discuss with Saleema Amershi on the podcast this week. Saleema is a Researcher at Microsoft Research AI (MSR AI) where she works on technologies for helping people build and use machine learning systems. 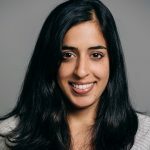 On the show we explore the need for interaction in machine learning and discuss some of the fascinating work Saleema has done in this space, as well as what visualization can do to make machine learning more transparent for its users.